See excerpts from "Ready for Sea" here! 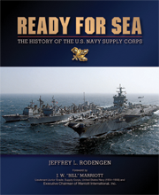 Scroll down to see sample pages from "Ready for Sea: A History of the U.S. Navy Supply Corps" is available in the Ship's Store! Check out some of the pages from this beautifully crafted, limited edition coffee table book below. It captures the history of the U.S. Navy's Supply Corps in a way not done before. Replete with historical references, the book describes the establishment of the Supply Corps under Tench Francis and follows it to the Naval Supply Systems Command of today. Through this historical context, you'll gain a new appreciation for what it means to be a U.S. Navy Supply Corps officer. "Ready for Sea" is a first of its kind and there are a limited number of copies. It will be a must have for anyone that wore, or will wear, an oak leaf on their uniform. Click here ... Ship's Store ... to order. You do not have to log in to your account to order a book.